Last fall, a new boat importer/dealer was launched at the annual sailboat show in Annapolis, Md., with modest expectations and a sound business plan suited for the economic conditions. Ultimately, Topaz Sailing Systems - and its two employee/owners - may one day be best known as the innovators of the "boat in a box." "When you launch a new boat company in 2009 in the U.S., you don&apos;t want a lot of overhead," says Peter Cook, 41, co-owner, British expatriate and former brand manager for Sunsail North America. 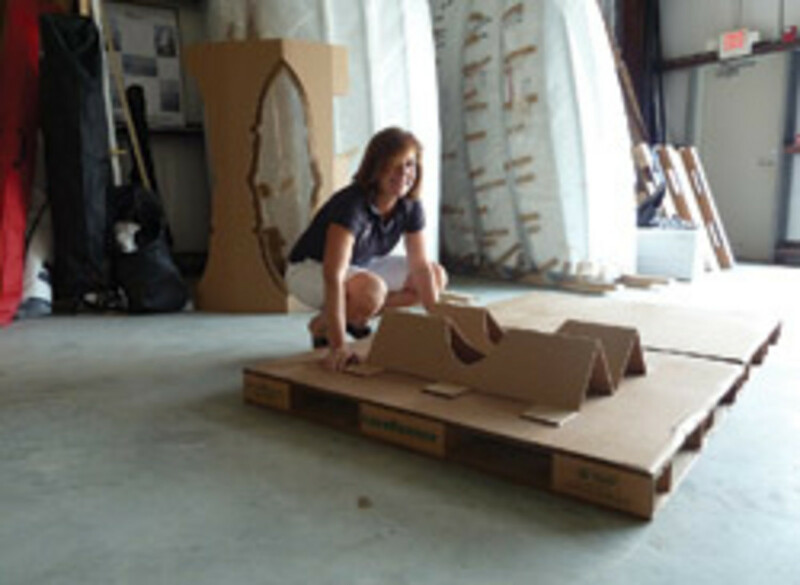 He and co-owner Karen Morris, 41, former marketing manager for Sunsail, are cautiously breaking into the U.S. sailing dinghy market - their eyes set on cost containment and innovative technology. "When you talk to us, you&apos;re talking to ownership, the sales team, the marketing team and shipping department," Cook says. As for launching a new company amid an epic recession, Morris says it came down to belief in the product. "I was told by many smart people in the industry to not do this, but I really believe in this; I&apos;m passionate about it," she says. "We thought outside the box and haven&apos;t been discouraged by anyone being discouraging." Cook grew up in central Wales and his boyhood passion for sailing carried him from instructor to upper-level manager of one of the largest charter firms in the world. 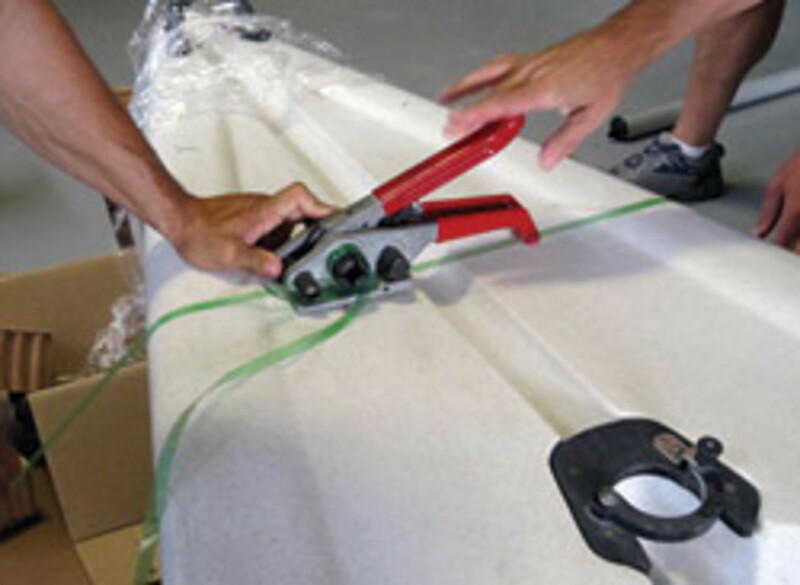 When Sunsail&apos;s Annapolis-based U.S. sales and marketing office was moved to Clearwater, Fla., in 2007, Cook recruited Morris to make headway into the U.S. dinghy market. He learned to sail on a sailing dinghy made by Topper - one of the largest dinghy manufacturers in the U.K. but virtually unknown in the United States. The roto-molded trilaminate polyethylene boats from the 35-year-old builder are known to be simple, easy to use, controllable and rugged. More than 50,000 have been sold worldwide. Cook and Morris worked out a deal to become the sole importer of Topper&apos;s 14-boat line. For now, they are importing the Topaz and smaller Taz lines, with plans for expansion. Their business model is bare-bones, relying on a website, word of mouth, publicity (including a "Best Boat" distinction from Sail magazine and a finalist acknowledgement from Sailing World), select boat shows and advertising, and a concerted effort to get people on the boats and on the water. Topaz buys directly from Topper and sells directly to the customer. Cook acknowledges the challenges of selling a largely unfamiliar $4,000 to $5,000 boat with almost no marketing budget and while operating out of a rented corner of catamaran builder Performance Cruising&apos;s warehouses. A key to containing costs without using a dealer network was efficiently and safely shipping the 9.5-foot Taz and 12.5-foot Topaz. An acquaintance told the entrepreneurs that Virginia Tech is known as a leader in pallet design. "We went down there and brought a demo boat, told them we wanted it packed so we could ship it by UPS and left it with them," Cook says. Packaging the Topaz boats became a student project for the university&apos;s Institute for Packaging Professionals, led by Ralph Rupert, director of the Center for Unit Load Design. "It was a fascinating project to give them the task and they came up with three distinct ideas," Cook says. "We picked one and then we fine-tuned it." For the price of a donated boat - which was raffled off for the benefit of the university - the company came away with what it calls the "boat in a box." 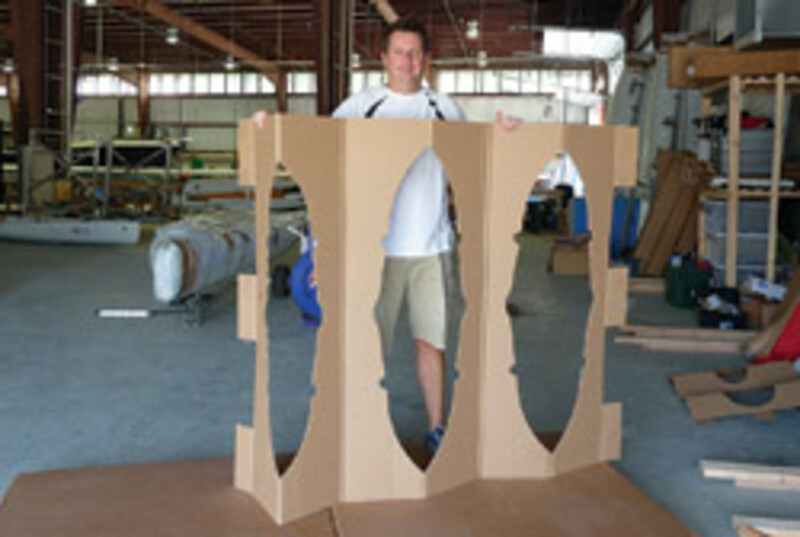 The packaging consists of two 13-by-5-foot lightweight, recyclable pallets constructed of three layers of corrugated material similar to cardboard. 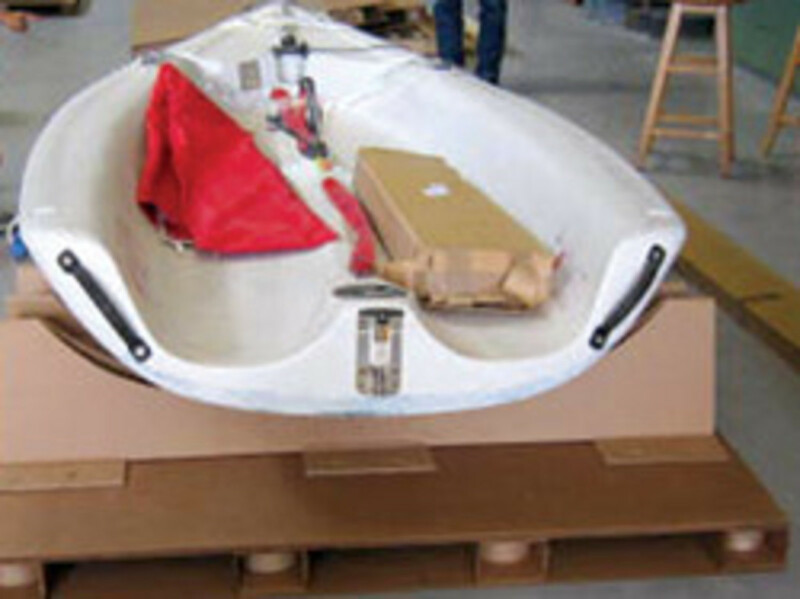 A cradle made of the same material protects and stabilizes the boat. Corrugated honeycomb reinforcement blocks are placed on vulnerable areas of the boat and the entire package is secured with plastic banding. The Topaz hull weighs 132 pounds and the total weight is 155 pounds with daggerboard, mast, hardware and so on. 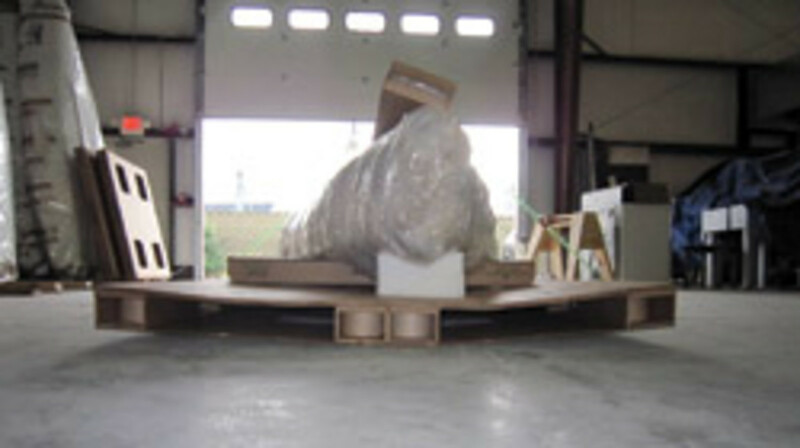 For long-distance shipments, a custom top can be used to seal the boat in true box form. The two-piece mast is placed in its own box and secured to the top. Cook and Morris can pack a boat in 45 minutes. "Every time we do it, we get a bit quicker," Cook says. It costs Topaz $300 to $500 to ship a boat anywhere in the continental United States. "I love the fact that we can talk to someone in North Dakota and get them a boat to their exact specifications in about seven days," Cook says. "We can ship a boat anywhere in the U.S. in about a week." To their knowledge, no boats have been damaged since they incorporated the new packaging, Cook says. The boats take two-and-a-half weeks to arrive in Annapolis from the U.K. - as many as 28 at a time in a 40-foot container. The sturdy hulls can be stacked five high and Topaz can store 30 boats in 1,000 square feet of space. The company has sold more than 40 boats, mostly to its targeted market of 14- to 16-year-old sailors, although at least six of the sales have been to older buyers, including a 78-year-old man, Morris says. "It wasn&apos;t a market we were targeting," says Morris, who grew up in Pennsylvania. Topaz had sold more than 20 boats this year as of early October, including two at the Annapolis sailboat show. The local Rockhall Sailing Club bought three - significant because it was the first club to purchase. "There are 8,000 Topazes in the world - mostly in Europe - and half are owned by schools and clubs," Cook says. "We came into it thinking from the beginning that we had to work really hard to sell to individuals and the clubs will come along." To stir up interest in the boats, the company this summer loaned demo boats to sailing clubs and schools through its Topaz Fun Fest promotion. "We&apos;re big believers in getting people on the water," Cook says. The company also has enlisted "Topaz Ambassadors" - satisfied customers who recruit others to try their boats - to help spread the word. Morris says her 10-year-old twins, Katy and Annie, have taken to the boat for its simplicity and rugged exterior. They know that minor accidents won&apos;t damage it. "My kids love it," she says. "They were the true product tester for me." Topaz Sailing Systems has not ruled out a dealer network and it sees expansion through several "distribution points" in key parts of the country, such as the Great Lakes or West Coast, along with "demo points" that would let potential customers test-sail the boats. The company website (www.topazsailing.com) is functional, but the partners have a wish list of ideas for improvement, including adding multimedia and blogs, and enabling easier customer feedback. A monthly e-newsletter was launched and, as members of Sail America, the company can leverage industry assets with e-mails sent en masse through the national organization. Cook says they plan to expand beyond the two models currently offered and he notes that Topper is working toward building its 12- and 14-foot catamarans with two-piece masts, which would enable "box" shipping. When that day comes, the co-owners plan to return to Virginia Tech and put the students to work - earning their "salary" with another donated boat.